We are in our new series. It’s all about living in freedom. Sam opened last week with what Jesus said. He followed up with what John said. Sam said, everyone who invites Jesus into their lives and surrenders their will, they will live in freedom. That should be normal. Then at the end, Sam shared a picture of what normal Christianity looks like. If you look at the handout today, or last week’s message, you will see a list of twenty questions. Things like, why would I live in fear when the Bible says God has not given me a spirit of fear, but of power, love and a sound mind? It should be normal for us to live in freedom, spiritual freedom. 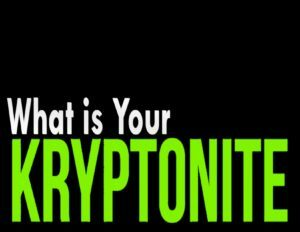 Our new series is called “What is your Kryptonite?” Everyone knows about Superman. Faster than a speeding bullet. More powerful than a locomotive. X-Ray vision. Infred eyes. Super hearing. Superman is unstoppable. He always saves the day. Nothing can defeat him – except kryptonite. It’s the one thing that steals his strength. As Christians, as disciples of Jesus, God has given us everything we need to live in freedom. However, many feel like we aren’t living in that freedom. Spiritually speaking, we are like Superman or Superwoman. However, many feel defeated. Scripture says, we are the children of God who can live in and defeat this evil world. We live in freedom. Allow me to explain that in more detail. When we walk through life, sin and shame gets stuck in our hearts and we can’t do anything to make it go away. When we come to God and ask Him to forgive us, He does. And, we don’t have to do anything in our human effort to earn that, it’s a gift. When we come to God, scripture tells us he pulls out our sin and shame and muck and pours it into Jesus. And at the same time, God pulls out the righteousness of God in Jesus and pours it into us. That means every time God sees us, He sees the righteousness of Jesus in us. He sees us as pure. We call it the unfair exchange because it was unfair to Jesus. And as a guarantee that God is with us, He gives us the Holy Spirit to live in us today and forever. That’s unbelievable. If that’s true, nothing can stop us. Do you see it? God gives us spiritual freedom. His grace. His righteousness. His Holy Spirit. Knowing that, we should conclude, nothing can stop me! Actually, something does stop us. What did Sam say last week? We have spiritual kryptonite. It called sin. It steals our spiritual identity. It steals our spiritual strength. It steals our closeness with God. The bible says, when we sin, we become slaves to sin. It has a power over us. The one thing that Sam brought out last week that is so important to understand. Everyone sins. That’s you. That’s me. That’s the person next to you. We are all in the same boat. The only difference between you and the person next to you, is they just sin differently. That means, we should be more focused on our sin and less focused on the sin of the person next to us. Our big question to you in this series is – What is your Kryptonite? What is it that is stealing your spiritual strength, your freedom? Today I want to talk about the battle we face as we leave the power and influence of sin to be fully surrendered to God. The battle will be in our mind. The battle will be believing that God is with you and in you and in love with you. Do you see it? The battle we face will be in our mind. Now let’s make this practical. Let’s talk about life for a second. Before we come to God and surrender our lives to Him, we learned how to live without Him. If we wanted to find happiness in our lives, we did it our way. Scripture explains it like this, ‘…we are dominated by our sinful nature.’ We did it for so long, those ways of living are deeply buried in our lives. They become habits. They become routine. Or, maybe you grew up in church. Maybe, you learned how to be religious. That means, I know what God says. I sing the songs. I attend church, but I’m not going to do what God says. I’m not going to apply what the Bible says. God says, forgive, but I hold onto grudges. God says, give, but I don’t give. God says, love the unlovable, but I only love people who treat me nicely. God says, trust me, but I walk in stress, anxiety and fear because I don’t want to give up control. Those ways of living can be deeply buried into our lives. Like a habit. Like a routine. In either case, when we finally do come to God and give Him our lives, it’s awesome. We experience the power of God’s grace. There is freedom and joy. In that moment, it’s exciting. We feel redeemed. We go back into life and discover that life is still ordinary. Life is messy. We still have homework. I have kids to raise and they still don’t listen to me. We still have a job waiting for us. We still have bills to pay and people to live with. And, we still struggle with sin and negative emotions. Many times, people wonder, why? If I gave my life to God, and I am supposed to be a spiritual Superman or Superwoman, why is life so ordinary? Actually, why do I feel defeated? I don’t feel redeemed. Why do I still wrestle with sin and negative emotions? Here is why. Before you came to God, you learned how to do life without God. Or, if you grew up in church, maybe you experienced religion and it was normal to hear about God stuff, but not apply it to your life. Those ways of living are so deeply buried in your life that it will take time change. Surrendering your life to God doesn’t automatically take those old ways of living away. We are learning how to leave the influence and power of sin and fully surrender to God. Did you see that verse, “…let God transform you into a new person by changing the way you think”? The process of leaving the influence and power of sin and being fully surrendered to God means we have to change how we think. It’s about renewing our minds. We need to see ourselves as spiritual Supermen or Superwomen. As people who are free. We have God’s grace, righteousness and Holy Spirit. Let me give you an example. Slavery in America was abolished by the thirteenth amendment on December 18th, 1865. That means slavery was illegal and everyone was free. Now think about the next day, December 19th. How many slaves understood that they were free and lived in complete freedom on December 19th? No one. To make it worse, the slave owners did nothing to help the slaves walk into freedom. The process of moving from slavery to freedom took generations. It took time. It was a battle all the way to the Civil Rights Movement and beyond to find equality. Legally, slaves were free but it took time to slave to see their identity as free and live in that freedom with courage. Do you see the analogy? We were once slaves to sin. Before coming to God, we learned how to do life without God. Or maybe we grew up in Church and learned how to be religious. We knew what God wanted, but we didn’t apply it into our lives. In either case, we lived under the influence of sin. And, your slave owner, Satan, will do nothing to help you walk into freedom. When we came to God and surrendered our lives, we were spiritually free in that moment. Sin was crushed. Nothing stopped us from living in freedom. Even though all that was true, that didn’t mean we automatically thought of ourselves as free, although we were. That didn’t mean we automatically thought we were filled with God’s righteousness, although we were. That didn’t mean we automatically thought God was living inside us with the Holy Spirit, although He did. Truth is we had doubt. We struggled to believe those things. We continued to look at ourselves as people who fail, who sin, who experience negative thoughts and emotions. A couple things about moving from the power and influence of sin and becoming fully surrendered to God. First, this will take time. All those old ways of living are so deeply planted in you, it will take time to change. New habits and new patterns take time to create. To move from trusting in yourself to trusting in God sometimes only comes as you walk through hard times with God. Some of the most gracious, beautiful hearted people you will ever meet have walked through the hardest of times with God. Secondly, this will feel like a battle. You will take two steps forward, one back. Maybe one step forward, two back. It may feel like a struggle because it is a struggle. You are in the process of giving control over to God. You ask for forgiveness for a sin, then boom, you sin again. You pray for God to remove the negative thoughts and emotions, then boom, they return. You aren’t a failure, you are in a battle. In this battle, you will wonder, when will I ever feel like I am victorious? Lastly, if you ever wonder, because I struggle with sin or negative thoughts or emotions, does that mean I lost my salvation? No, actually it is proof that you are figuring it out. When you sin with no guilt or remorse, that is a problem. But, when you sin and come back to God for forgiveness, that means you are figuring it out. When you struggle with negative thoughts and emotions and you turn to God, that doesn’t mean you failed, that means you are dependent on God. Our process of leaving the influence and power of sin and being fully surrendered to God means we have to change how we think. It’s about renewing our minds and holding onto what God says about us. Scripture says, “…take captive every thought.” Why? Because there is a battle for you mind. The power and influence of sin will always tell us, you are still a slave. You are alone. You are not enough. God has quit on you. You are a failure. Our transformation depends on us believing the truth that we are free. It’s about understanding that regardless of how we feel, regardless of the time it takes, regardless of the struggle, God loves you and you are being transformed. You are free. Maybe your kryptonite is feeling like you are not free, but the truth is, you really are. Maybe your kryptonite is thinking it takes too long, but the truth is, it’s perfect timing. Maybe your kryptonite is believing that because you struggle, you have failed, but the truth is, you are in a battle. The challenge to you is to take captive of every thought you have. If you gave your life to Christ and asked the Holy Spirit to come into your life, you are free. If you can say, I bring my sin and failure to God and ask Him to forgive and heal me regularly, you are free. So, if the thoughts in your mind are leading you to believe you aren’t worthy, you are a failure, God rejects you, etc. All of that is a lie. Take captive of every thought.